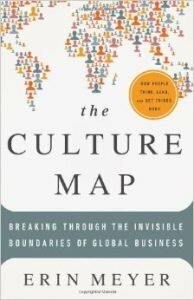 Erin Meyer’s recent book, ‘The Culture Map’, takes a very approachable and hands on approach to helping individuals and organisations develop an understanding of working in cross cultural environments. In it, she uses a combination of data, stories and cases to support its propositions. In her book, Meyer sets out the average cultural “scores” of different nations across eight different characteristics. This builds a set of data that can then be used to numerically compare characteristics between cultures. The “Culture Map” concept, after which the book is named, is then the process that Meyer uses to graphically illustrate to readers how the overall cultural characteristics of one country will vary against the culture of other countries, by drawing a series of lines between the numeric value of each. This graphic representation gives a very powerful and tactile demonstration of the large and small fundamental differences between cultures. This demonstration can then be used to help to educate personnel who will be required to work in cross cultural environments, giving them an appreciation of where the different cultures they will be exposed to will be most similar and most divergent from each other and from their own. While the way Meyer works through the process of setting out the eight characteristics makes the material easy for those new to cross cultural work to follow, from an academic perspective I was a little disappointed that the development of the data used to establish each of the rankings is only discussed briefly. Having more information on the background source for the data would, for me, have taken this from being an excellent book for beginners through to experienced cross cultural workers, to one that would have had a similar standing in an academic environment. I would have absolutely no hesitation in recommending this as a ‘must read’ book for anyone with either a practical or academic interest in building a strong cross cultural working understanding. It is accessible, easy to read, has plenty of real world examples to illustrate its material and, with the graphical, culture map approach, gives a very easy to understand picture of how different cultures compare. To keep up to date, please sign up to our regular newsletter using the form below to receive our regular newsletter.